Two hundred cows produce the milk used to make Marshfield Farm’s twenty five flavours of ice cream. Best of all, the cattle graze the fields surrounding the dairy which means super fresh milk is used to produce top quality ice cream - not a single scoop of skimmed milk powder in sight. 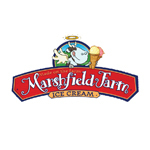 In fact the whole production process takes place at Marshfield Farm, a rarity today!